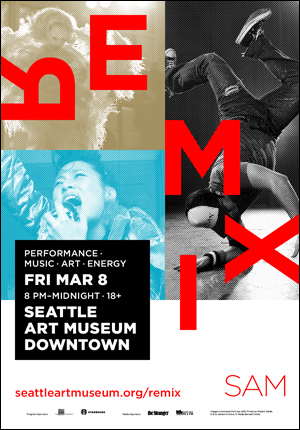 As the newest PR intern, it is slightly embarrassing for me to say that I have never been to SAM Remix, but this March 8 will be my very first time. As disconcerting as my lack of experience may be, I have made up for it with enthusiastic research and comprehensive interviews, which I believe present an authentic representation of the evening. It is my deepest desire that the following information may help other Remix newbies better prepare themselves for the upcoming SAM Remix. March 8 will be a night worthy of Marie Antoinette’s fancies—exploding with performances, dancing, art, music, self-expression and celebration. Upon arrival your body will crave to bop, hop and drop to the beats of DJ J Justice spinning soul, pop, and hip hop; until your eyes lure you away to the backroom lounge where the Atomic Bombshell’s will be performing provocative burlesque inspired by the racy backstories of portraits featured in SAM’s new exhibition Rembrandt, Van Dyck, Gainsborough: The Treasures of Kenwood House, London (Check out Kitty Fisher if your interests are peaked). Before long, the desire to express your own creativity will manifest as you design and don a wig fit for the 16th century alongside artist Romson Bustillo at Couture Coiffure. Archaic embellishments will become addicting as you are drawn through a flurry of feathers, ribbons and bling at Fabulous Fascinators where Janet Fagan will aid in trimming your wig with a lavish headpiece. Fashion a becoming brooch at the sophisticated Pictorial Pins station with artist Julie Alpert and then head down the Artist Walk of Fame and adorn the stars of celebrity artists featured in SAM’s collection, such as Jeff Koons and Cai Guo-Qiang. Smooth sonic landscapes, by DJ Jaymz Nylon (who regularly spins at the Electric Tea Garden), will indulge your ears with Afro-Latin influences, broken beats and disco, as your pulsating body transports you to Celeste Cooning’s Artist Atelier. Inside Cooning’s paper installation studio, live models pose for artist Alicia Betty’s portrait activities—providing an authentic artistic experience before entering the galleries. Physically and mentally prepared for the magnificent collections of masterpieces, dazzling baroque and classical music performed by soprano Linda Tsatsanis and cellist Nathan Whittaker will resonate throughout the Third Floor urging you towards the My Favorite Things: Highly Opinionated Tours. Led by a mix of overwhelmingly opinionated artists and collectors, you will experience the galleries in new and unexpected ways with tours led by: SAM Board of Trustees and collector John Frank; Seattle artists Lorenzo Moog, Anne Siems and Troy Gua; Seattle fashion designer and artist Anna Rose Telcs; and Royal Alley-Barnes & Zola Mumford of the Langston Hughes Performing Arts Center. Finish your experience on the Fourth Floor with one of the oldest cultural icons, Romeo and Juliet. Let the Seattle Shakespeare Company pull your heartstrings as they perform poignant courting scenes alongside paintings from Romeo and Juliet’s time. SAM Remix is nothing short of a 21st century Renaissance, providing a “rebirth” of artistic expression and individualism—from burlesque dancers to theatrical scenes of Romeo and Juliet to opinionated tours of Rembrandt, Van Dyck, Gainsborough—positioned throughout the museum as unique live attractions ready to delight for a limited time only. As far as I can tell, missing SAM Remix would be an epic tragedy.